Personalize your own stadium seat cushion for all your events. These vinyl cushions are ideal promotional products for any establishment looking to expand its customer base. Made in the USA and personalized to your taste, these vinyl dipped stadium cushions will surely leave a lasting impression. Cushions are great giveaways for current and prospective customers. Who needs a chair when you have this supremely comfortable, lightweight, and highly transportable folding cushion? Use for camping, concerts, ball games, and much more! 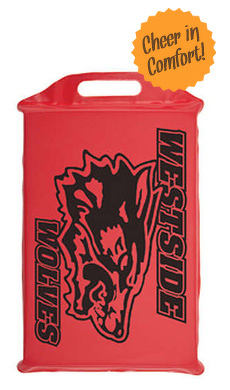 Closed cell foam football cushions are an affordable, effective promotional product for your business or organization. Football shaped stadium cushions are great giveaways for current and prospective customers. Perfect for outdoor sporting events, football, baseball, hockey, etc. Cushion is made with vinyl dipped 1" closed cell material, available in many different colors and easily for Carried from event to event.